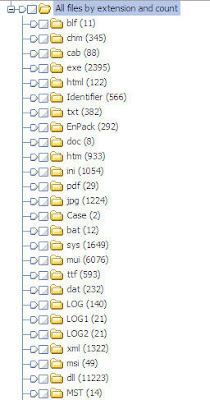 Several months ago I did an EnScript to count up all the file extensions and then provide a summary of all the extensions and how many files with each extension. You can find that EnScript here. This EnScript is similar but it makes a bookmark folder for every file extension and then bookmarks each file into the respective file extension folder for quick review. The number next to the file extension is the number of files that match that extension. You could use this to quickly look at common file extension types or to identify what file extension types are prevalent on a specific system. Depending on how many files you have in your evidence, this may take several minutes to generate (~5 mins for 100,000 files). i hv a few question about this enscript, i used it in my case analysis and it's working. however, it need to export all bookmark files. for example, i need to export all DOC file, then i select all, and tag selected. But, i found that the total selected and total bookmark not consistent. can u give me some explaination what happening to help me explain in my case analysis. Nice script, is it possible to make it run again checked files only? and maybe provide a sum of logical size? @Anonymous - Contact me by email so we can discuss.